The price of freedom is very high and very dear for so many families. Robert Stokely lost his son Mike last year and has shared his thoughts about the cost his family has paid. People say freedom isn’t free, yet everyday most enjoy freedom at no cost to themselves. But for the American Soldier and their families the cost is great. Some bear physical wounds and scars while others bear emotional wounds that never heal. Some lose irreplaceable time with their children for events like birth, each birthday, winning homerun, first place at band competition and many other daily events can’t be adequately captured by video, even in real time. Some come home so changed, that they can’t re-adapt to what they left, nor can those at home adapt to the person who came home. Some face grave financial hardship which alters family prosperity for a lifetime. In the end, all who serve and their families pay a price for freedom. I have been asked what I thought the real cost of the fight for freedom was. Mike Stokely would have made a great dad, granddad, and uncle, for he was a great husband, son, brother, grandson, nephew and cousin. 144 years and six generations before Mike Stokely’s death, William G. Stokely died as a prisoner of war in the Civil War. There will be no 144 years and six generations from Mike Stokely, for he had no children. The sound at Christmas, birthdays, vacations, and holidays will not hear the happy cries of children saying watch me daddy or hey uncle Mike. Mike Stokely will never be asked “who gives this woman in marriage”? Mike Stokely will not even get to grieve and shed a tear at the grave of his parents. 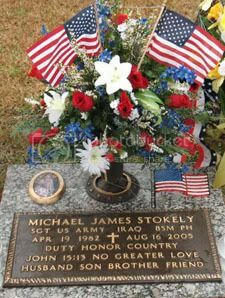 For Mike Stokely and our family, the cost of freedom is a lifetime of love. Soldiers do not serve for money, fame, or future. Soldiers are the few who care enough to sacrifice some or all of their life so that the majority do not have to. Remembering them one day a year is little enough to give back. To the Veterans who lived to come home, thank you for serving and thank you for living. To the fallen, especially my son, I can never thank you enough for what you have given and the best I can do is to remember and honor your sacrifice. Showing gratitude for something so precious, given freely, is the very least we can do for our veterans, for those who did not come home and to their families. We lost fair and square. No doubt there was cheating in places, but there always is. Sure, we had all of the media except for Fox News against us (the Washington Times is too small to count much), but that's always been the case, and this time we do have the blogosphere. Bottom line is we shouldn't start in on how "the people are stupid", but rather use it as a time to plan for victory in 2008. Let's not become like a bunch of moonbats and start falling for all sorts of wild conspiracy theories about voter "intimidation", Diebold machines and all what-not. Further, let's not overreact. I can't find the link right now to prove it, but from what I've read GOP losses were about average for a the 2nd mid-term elections of a two-term president. Clinton did well in 1998, but he suffered his loss in 1994. Although most MSM pundits, and the Democrat leadership, will say that the reason Republicans were defeated was that going into Iraq was a mistake. More about the war below, but this is at best a half-truth. I think Mark Steyn sums it up well: this was a normal 6th year election, not a paradigm shift. narrow margins in both houses of Congress, and we're back to divided government. I think the left's pickups were basically due to disenchantment with Bush and the state of the war in Iraq. In retrospect, isn't it fair to say that Bush's reelection and the Congressional results in '04 were basically a message to him? Get Iraq right, you've got two years or else. And he hasn't got Iraq right, so the "or else" arrived as threatened. No doubt there is a lot of truth to this. The American people are frustrated with Iraq. They want - or wanted - victory. Since this has not occured, they want to put someone else in charge. This is understandable. But I think that Republicans could have survived had they kept their base. They didn't because the President and the Republicans in Congress didn't carry forth on their promises. The big three that I can think of are: 1) Spending on pork-barrell projects. Too many thought that they could buy off their constituants by "bringing home the bacon". This might work with liberals, but it turns off conservatives. 2) An ever-increasing federal government. At least Reagan tried to kill the utterly useless Dept of Education, and in the 1990s we tried to get rid of federal spending for the arts, but today's Republicans don't even try. 3) Illegan immigration. More on this below, but suffice it to say that this has become a huge issue and the national GOP refused to address the issue until it was too late. Corruption was also an issue. It's not so much specific cases, as it is just the perception that Haskert et al didn't want to reform the system after the Abramoff scandal broke. And it's based in truth, because they didn't. It's no use complaining that there's a double standard, our guys (Cunningham, Foley) resign while theirs (Studds, Hastings) continue in office. Let's just resolve to purge our ranks of wrong-doers and start over again. The Democrat leadership will say that the election proves that Iraq was a mistake and that we need an immediate pull-out. I think it's more that Americans' are just disappointed that we haven't won it. The lesson, I think, is that after the initial invasion we lapsed into a series of half-measures when we should have gone for broke. James Robbins thinks we're headed "back to the seventies", and it's hard to disagree. Whether they did so consciously or not, the American people chose the party of cut-and-run. There's no no nice way to put it. You can say that the Virginia Senate race, for example, was lost by Allen's mistakes all you want, but the fact is that Webb was Mr. anti-war and this is who they chose. Sooner or later, Baker's recommendations will likely be implemented, at which point al-Qaeda will be left in control of Anbar, Salahaddin, and possibly Babil and Diyala as well. They won't have any oil, but they'll have their failed state and that will give them a base from which to strike throughout the rest of the Middle East. Whether or not they are able to work out a manageable detente with Muqtada al-Sadr (who I expect will likely seize the southern part of the country), they won't be able to conquer his territory nor vice versa, meaning that we will still have a failed terrorist state made up of what was central Iraq to deal with. Oh, and a lot of innocent Iraqis are going to die, probably in the tens of thousands. But no one here will care about them, just like no one ever cares about the hundreds of thousands of South Vietnamese and Cambodians who died when we abandoned Vietnam, but the important thing is that we'll all feel that much better. You'll hear a lot of "The GOP lost the Latino vote because of it's hard-line stance on illegals". Me: so you're saying that Latinos are in favor of illegal behavior? If so, then I don't want them in my party. Now, maybe we revisit the details of how we go about stopping illegal crossings (focus more on jailing employers or increasing legal immigration), but no way am I going to turn a blind eye to illegal immigration. Besides, it'll just alienate the base, and all you'll have accomplished is trade one voter for another. The big danger here is that Bush or some other Republican will say that "this proves the need for comprehensive immigration reform", which will only drive the base further from the party. I disagree with Fred Barnes that "what Americans want is a comprehensive solution to the immigration crisis" He says that Republicans "come together on a "comprehensive" measure that not only secures the border but also provides a way for illegals in the United States to work their way to citizenship and establishes a temporary worker program." What a joke. We've been down this path before. When Reagain was president they passed a "comprehensive" bill which legalized the illegals, but it ended up ignoring the border problem. If they pass another "comprehensive" bill, we'll get the same thing: they'll legalize the legals, and once the see that attention is diverted to something else will go back on their promises to secure the border. It's all guaranteed to keep illegals streaming into the country. What a joke. Yes I know, what about JD Hayworth? He's big on stopping illegal immigration and he lost his house seat. I'd say that his problem was that he made it his centerpiece, and it's the single issue by which we came to know him. He became too vehement on it and became perceived as a bit of a fanatic. Basically, he overplayed his hand. So while stopping illegal immigration should be part of the conservative agenda, it should not be centerpiece of the agenda. 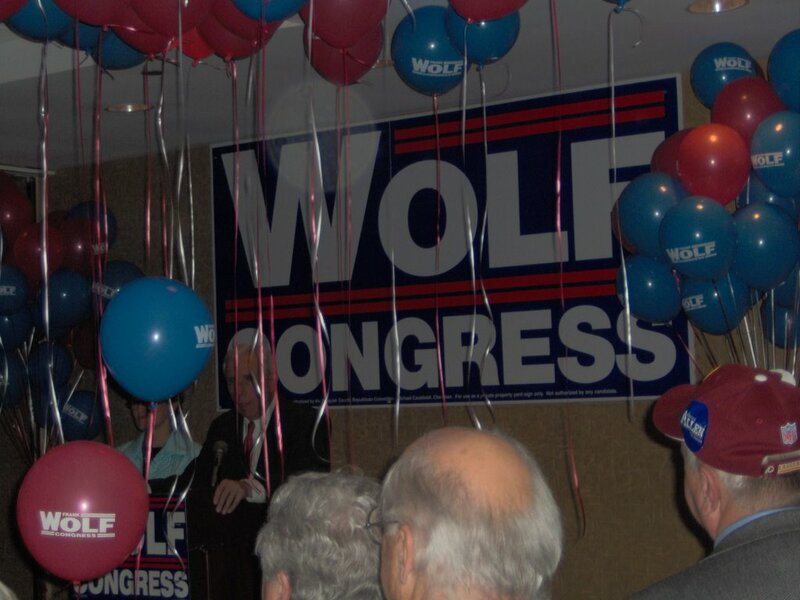 Last night I wrote about how my local congressman, Frank Wolf, won reelection. It was about the only good news of the night. Virginia Democratic Senate candidate James Webb, who was critically wounded as a Marine in Vietnam, said yesterday that he is uncomfortable talking about his personal story even if doing so could help him unseat Republican Sen. George Allen on Nov. 7. When Webb claimed victory, he did it as a Marine. He came into the Vienna hotel ballroom accompanied by his brother Gary playing the bagpipes, and about a dozen of his Marine buddies emerged from behind the stage. He stood at attention, ramrod straight, as they filed in. The biggest disappointment of the night was Michael Steele's loss in Maryland. I think everyone in the conservative camp was pulling for him, and if it hadn't been a hard year for Republicans all 'round, he would have won. I don't think we've heard the last of him, though, and that is a good thing. Allen and Steele lost, and The Washington Post won. Also, I've heard that this enhances the prestige of John McCain. Obviously, with the defeat of George Allen, this removes one of his potential challengers for 2008. Given that evangelicals will likely reject Mitt Romney because of his Morman beliefs, and Guliani is simply too liberal, this enhances McCain's chances of getting the nomination. But since he is despised by so many conservatives, it also greatly increases the chance of a Democrat seizing the White House. Romney, in his press release, said all the things that conservatives want to hear. I'm starting to like him more and more, but I just don't think he'll be able to get over the "Mormon thing". Meanwhile, John McCain is saying all the right things on Iraq in his most recent press releases, see here and here. For all of my differences w/McCain, he is right on the war. And his take down of Barack Obama last February was beautiful. And deserved. Pretty sparse, but here are a few things to consider. The Michigan Civil Rights Initiative, and the Marriage Amendment in Virginia won by convincing margins. So the left needs to realize that the American people aren't buying their social visions. Also, notice now gun control and abortion have disappeared from Democrat talking points? With the former, almost all Democrats now at least say that they're pro-2nd Amendment. Only the ones in the bluest of districts talk about passing new gun-control laws. See David Kopel's article on how our Second Amendment freedoms are largely still secure even with a Democrat House and Senate. In addition, Arizona passed Prop. 103, English as the state's official language, 74%-26%. This, too, is a good thing. Other than that, I hear we won a few dogcatcher races out west somewhere. I just got back from Rep Frank Wolf's victory party at the Holiday Inn near Dulles VA. Rep Wolf is the Republican incumbent for Virginia's 10th district, and area covering parts of northern Virginia from near Washington DC to the West Virginia Border. As of this writing, here are the unofficial results from the state Board of Elections website. Mr Wolf gave a spirited, but very positive, victory speech. He stressed that he tried hard to run a positive campaign, focusing on his accomplishments, such as founding a regional gang violence task force. In a year where there have been many scandals on both sides of the isle, he pointed out his reputation for honesty and integrity. He mentioned the Iraq Study Group, which he had proposed and lobbied for. He also emphasized the need to bring both Republicans and Democrats together to search for solutions for our problems. Given that northern Virginia is turning bluer, and that he consistently wins by convincing margins, this is not just a lot of hot air. Although Wolf is a conservative, he is not given to partisan sniping, and is on good terms with local Democrats. More about his positions can be found on his campaign website and his official House website. Besides his strong support for our country taking an active role in fighting the War on Islamic Fascism, he has been a leader in bringing awareness and action to human rights issues in the Sudan, Ethiopia, and elsewhere. While other congressmen take junkets to Hawaii, Wolf goes to Sudan. Check out his trip reports here. I was able to get out several weekends and take part in "lit drops", walking through neighborhood after neighborhood leaving literature on doors. It was a small roll in the overall campaign, but if a few hundred people each take a little bit of time to work for something or someone they believe in it all adds up. Wolf is a man who talks the talk and walks the walk. I am proud to have him as my congressional representative. There is only one issue in this election that will matter five or ten years from now, and that's the War on Terror. And the success of the War on Terror now teeters on the fulcrum of this election. If control of the House passes into Democratic hands, there are enough withdraw-on-a-timetable Democrats in positions of prominence that it will not only seem to be a victory for our enemies, it will be one. Unfortunately, the opposite is not the case -- if the Republican Party remains in control of both houses of Congress there is no guarantee that the outcome of the present war will be favorable for us or anyone else. But at least there will be a chance. 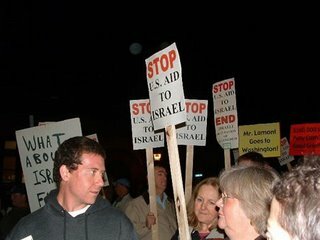 ...To all intents and purposes, when the Democratic Party jettisoned Joseph Lieberman over the issue of his support of this war, they kicked me out as well. The party of Harry Truman and Daniel Patrick Moynihan -- the party I joined back in the 1970s -- is dead. Of suicide. ...we are not waging a "War in Iraq." We are waging a world war, in which the campaigns to topple the governments of Iraq and Afghanistan were brilliantly successful, and the current "lukewarm" war demands great patience and determination from the American people as we ready ourselves for the next phase. It's a lengthy article, and you'll want to read the whole thing, but these quotes lay out the author's thesis. It is one with which I agree. Lest you doubt just how irresponsible the Democrats have become, here are two additional pieces of evidence that you can add to your collection. Both come via LGF, which is one of the best blogs in existence. I think the photograph speaks for itself. Sen. Barbara Boxer, D-Calif., said Democrats want to redirect Bush's policies so the country is focused more on fighting terrorism. "My plan would be to focus on getting Osama bin Laden and al-Qaida ... and begin redeploying troops out of Iraq where they are fueling terrorists and return to fighting the war on terror," she said. Now, getting OBL would be a good thing, but put your dunce cap on if you think that getting him means that we've won the war. As one commenter on LGF said, "Getting Osama bin Laden will have the same effect on the WOT as Ray Croc's death did to McDonalds." And of course neither she nor any other Democrat has offered any concrete plan to "get" bin Laden. All of which is exactly why the Democrats as a party are completely irresponsible and need to be kept out of power.